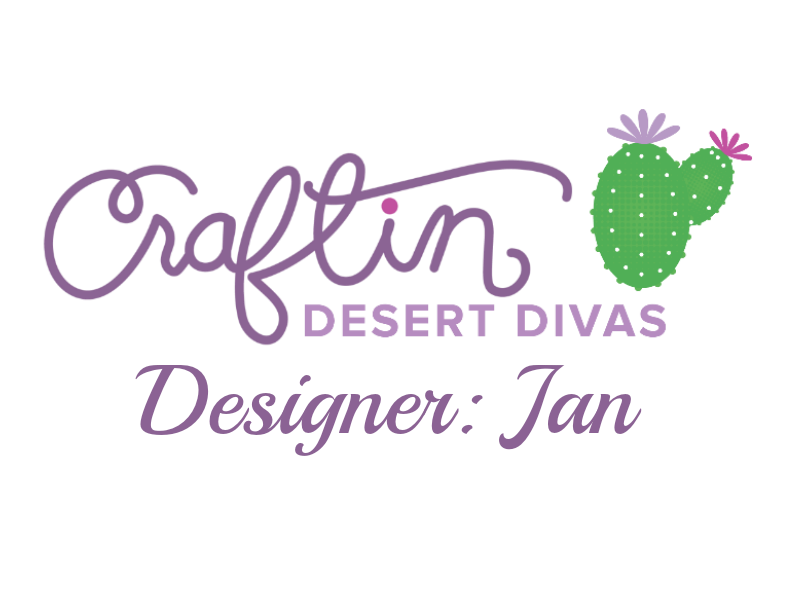 It's Jan here from handcraft hobby. 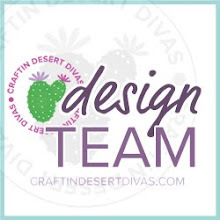 Today I am on Craftin Desert Divas' Blog sharing with you my projcet. 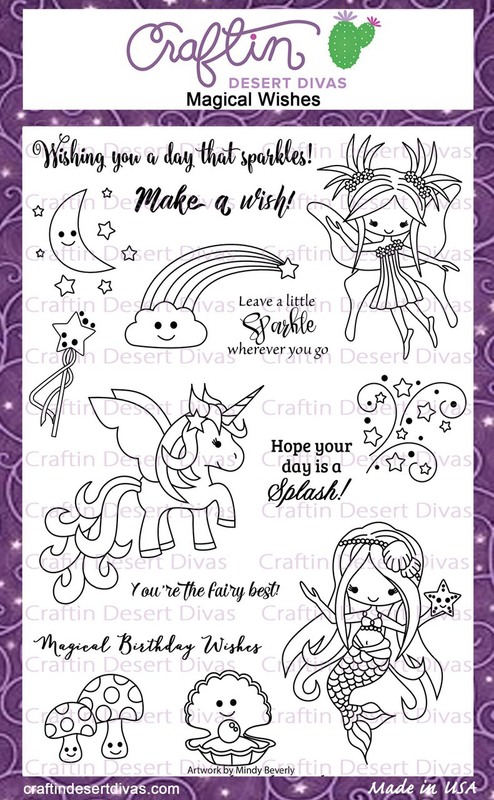 I am falling in love with this Magical Wishes stamp set. 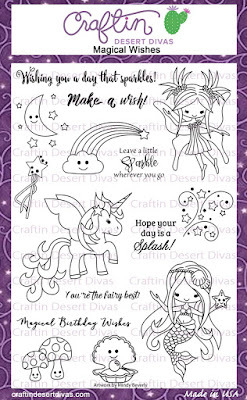 It's fully packed with many pretty images like Fairy, Mermaid, Unicorn and many more. 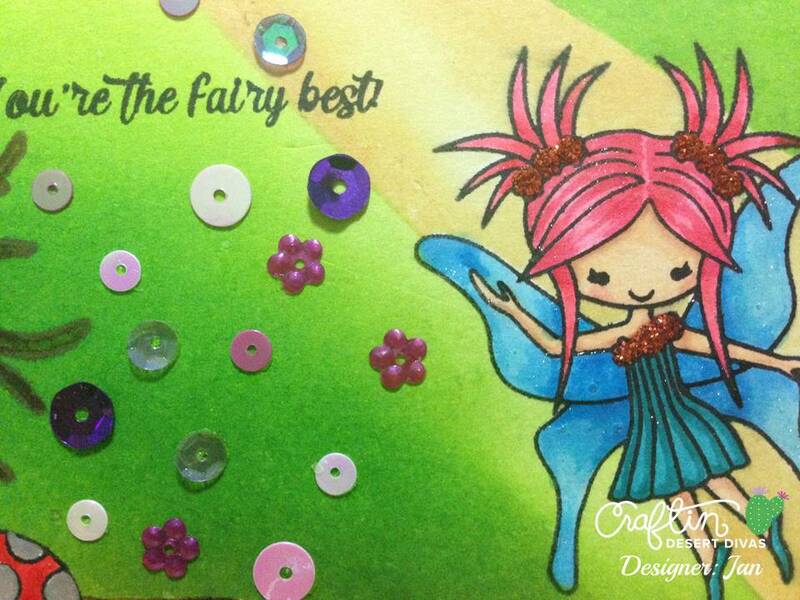 Today I chose Fairy image to made my card.. 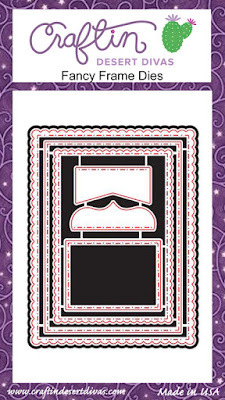 I used alot of masking technique in this card. Started by stamping my mashroom then masked it off by stamping again on masking paper or post-it note and cut it out. 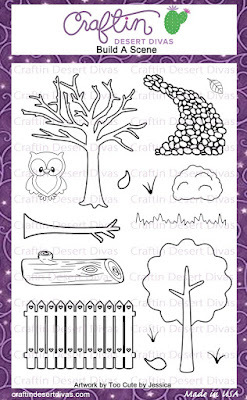 Then I stamped the log and masked it off and I moved on to the tree and also masked it off. I then stamped my main image the fairy from Magical Wishes stamp set as if she's floated in the air and I also masked her off. 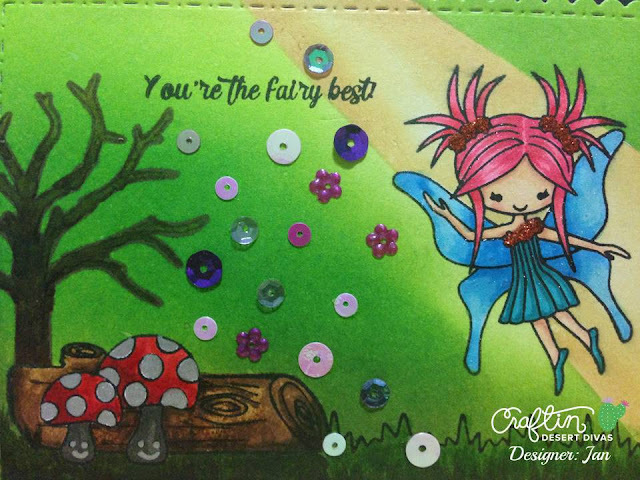 The fairy and the mushroom are from Magical Wishes stamp set. 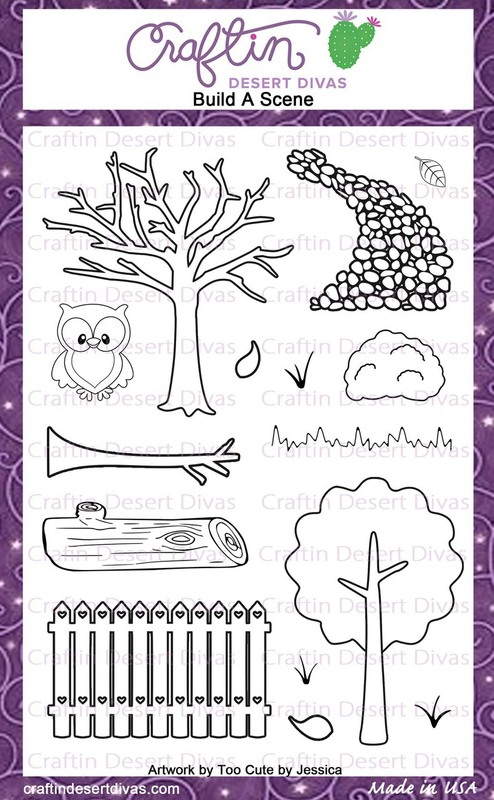 The log, tree and grass border are from Build A Scene stamp set. I then began to ink up my background using distress ink and also masking technique. 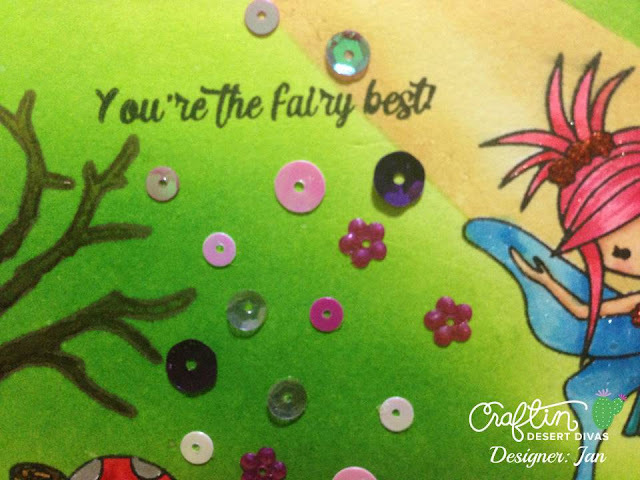 The idea was to make the scene as the light shining thru the fairy when she gives her blessing. *lol* I used Mustard Seed for the sun light and Twisted citron, Mowed Lawn and Peeled Paint to make my forest scene..
After I've done with the background I took off all my maskings and began to color all my images with various copic markers. I then stamped the grass border to fill up the bottom part of my panel and also colored it with copic markers. 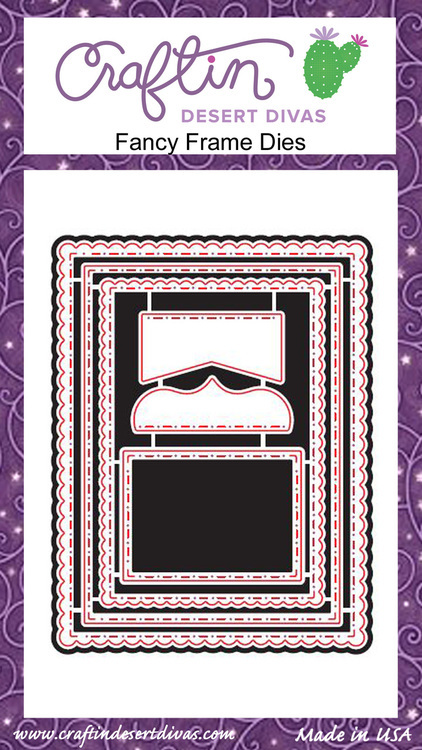 I then cut the panel using my Fancy Frame Dies and attached it to my black card stock to make a frame. 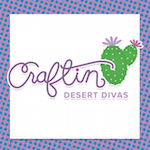 And adhered it to my light blue card based. I stamped the sentiment at the top of my card. and used wink of stella on all over my fairy. I used grossy accent on the wings and red stickles on the flowers. 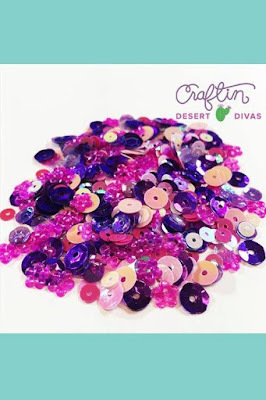 To finish my card, I added alot of Pizazz Sequins. 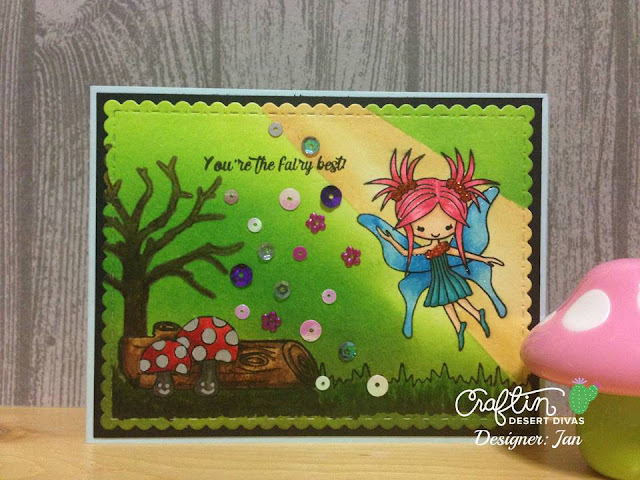 Such a cool effect with the light beam on the fairy, adorable card!